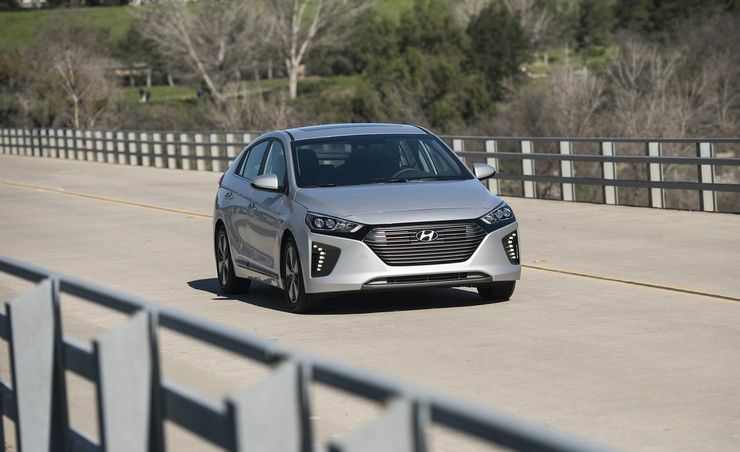 Hyundai has priced its electrified Ioniq models competitively to do battle with green-car mainstays like the Toyota Prius and the Chevrolet Volt, and the plug-in hybrid version that's joining the lineup for 2018 is no exception. Starting at $25,835, the 2018 Ioniq plug-in hybrid costs just $2750 more than the least expensive Ioniq conventional hybrid, and it undercuts all other plug-in hybrid vehicles on the market. That attractive base price includes a generous load of standard equipment, including proximity key entry, dual-zone automatic climate control, heated front seats, and a 7.0-inch touchscreen with Apple CarPlay and Android Auto functionality. A Limited trim level is also offered for $29,185, adding leather upholstery, a power driver's seat, and blind-spot monitoring. Add $3750 for the Limited Ultimate package that pulls out all the stops, including features such as a sunroof, adaptive cruise control, lane-keeping assist, a larger 8.0-inch touchscreen with navigation, and a premium Infinity audio system. Key differences between the Ioniq plug-in hybrid and the Ioniq hybrid include a larger, 8.9-kWh battery pack (versus 1.6 kWh in the hybrid) and—as the name implies—the ability to plug in and charge up said battery pack. Charging from empty on a 240-volt Level 2 charger is estimated to take just over two hours. The EPA says that the Ioniq plug-in will go 29 electric-only miles on a charge, and that it will achieve 52 mpg combined when running in hybrid mode once the batteries are depleted. The plug-in hybrid's electric motor also is slightly more powerful than the hybrid's, enabling electric-only driving at up to 75 mph. The plug-in hybrid shares the same 1.6-liter Atkinson-cycle inline-four engine and six-speed dual-clutch transmission as the hybrid. Those numbers stack up well against the Ioniq plug-in hybrid's more costly competitors. The Toyota Prius Prime provides less electric-only range, at 25 miles, even though its combined fuel economy of 54 mpg is slightly higher, while the Chevrolet Volt‘s combined fuel economy is rated at a significantly lower 42 mpg, even if its electric-only range of 53 miles beats the Ioniq by a fair margin. The Kia Niro plug-in hybrid, which shares many powertrain components with the Hyundai, offers slightly lower numbers than the Ioniq (26-mile range and a 46 mpg combined rating). Honda's larger Clarity plug-in hybrid, which starts nearly $10,000 higher, offers an impressive 48 miles of range but a lower 42 mpg combined rating. Plug-in hybrid shoppers will definitely be spoiled for choice once the Ioniq plug-in arrives at dealerships within the next few months. In typical Hyundai fashion, it appears to offer perhaps the most compelling value proposition in its competitive set.